In order to remove a tick safely from your body, the correcty method must be used. There are a lot of different ways to remove ticks floating around the internet, but there is only one proven way to safely remove them, and that’s with tweezers, specifically pointed tweezers. This graphic clearly and simply shows the correct technique for pulling a tick out of your skin. In addition to showing how to remove a tick, this graphic also provides some intersting information about ticks, including a few tick myths, and the truths about such myths. One interesting fact about Ticks is that as long as you can find and pull them out of a bite within 24 hours, the bitten victim has a significantly higher chance of excaping any pathogens that might have been transmitted from the tick. Ticks are known to pass along many different diseases and knowning how to safely remove them is extremeley important, especially for people who love the great outdoors. 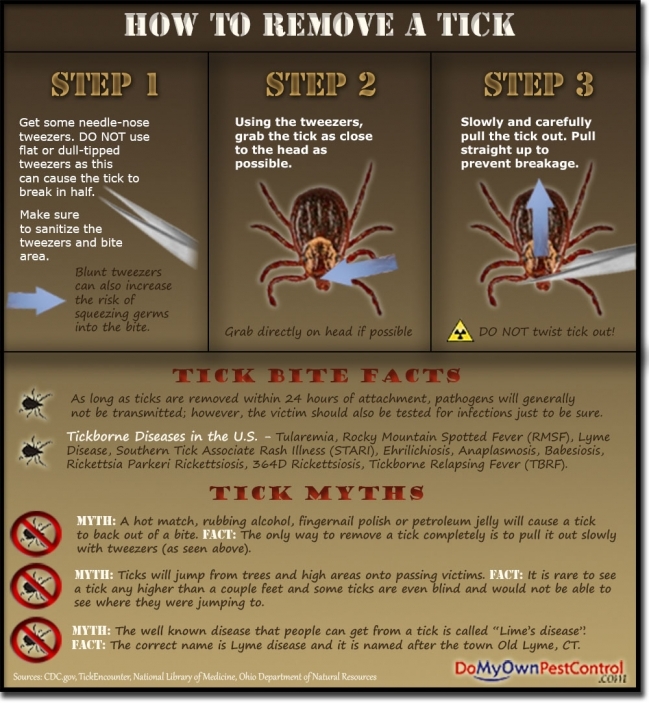 This graphic showing how to remove a tick was created by Do-It-Yourself Pest Control.